The J D Wetherspoon International Real Ale Festival comes to The Green Ginger, Torquay from Friday 28 March until Sunday 13 April. Speciality beers with flavours including: juniper, lemon, plum, raspberry and many others! 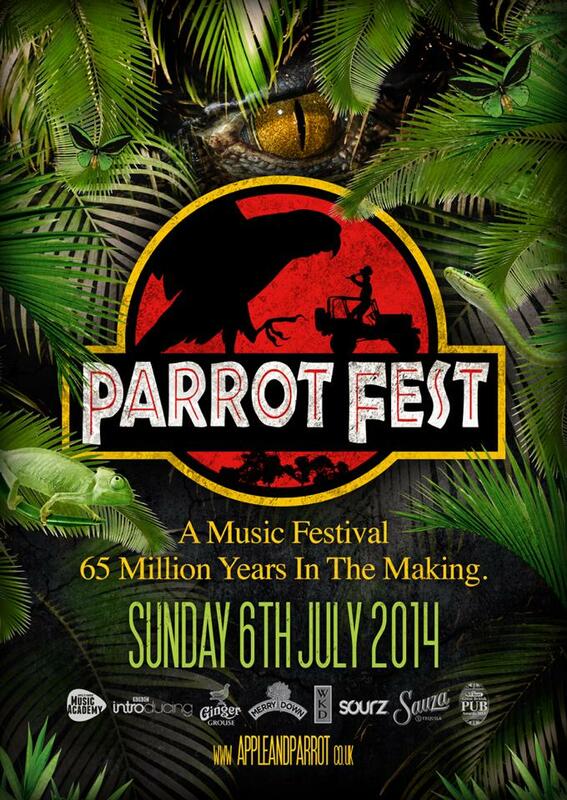 5 Days of Live Music, DJs, Competitions, Games, Beers, Banter, Food and general Debauchery! HIRE A BEER PONG BOOTH IN THE CLUB! Get everything you need to hold your very own beer pong competition with your friends including 2 Jugs of Beer! 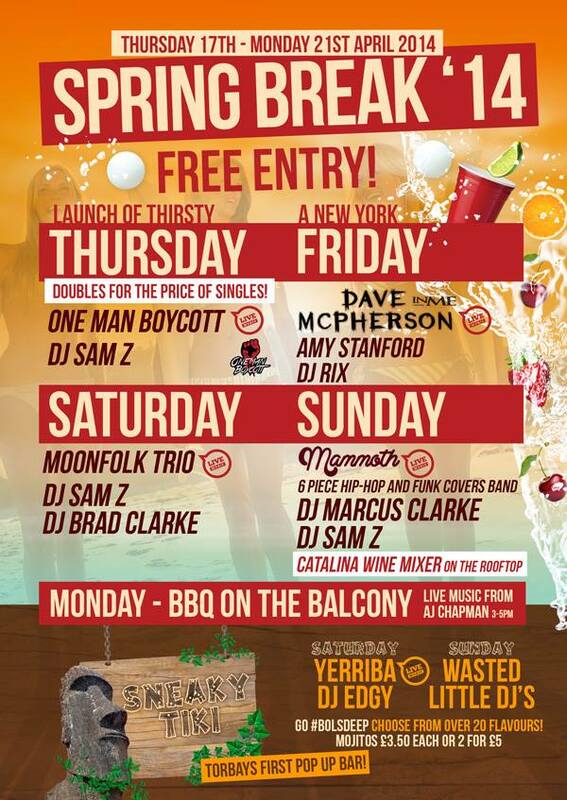 Mambo brings you Doubles for the price of Singles as we launch our new look Thursday nights! DJ SamZ dropping huge tunes and your requests all night! 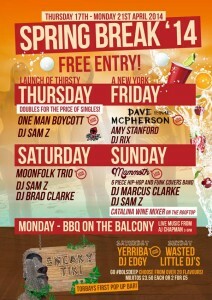 The Long Awaited Easter Weekend Is Almost Upon Us!! 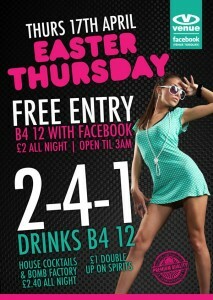 Join Us This Easter Thursday!! Free Entry Before 12 With A Facebook Guest List // £2 Entry All Night Without! All Drinks 2-4-1 Before Midnight!!! 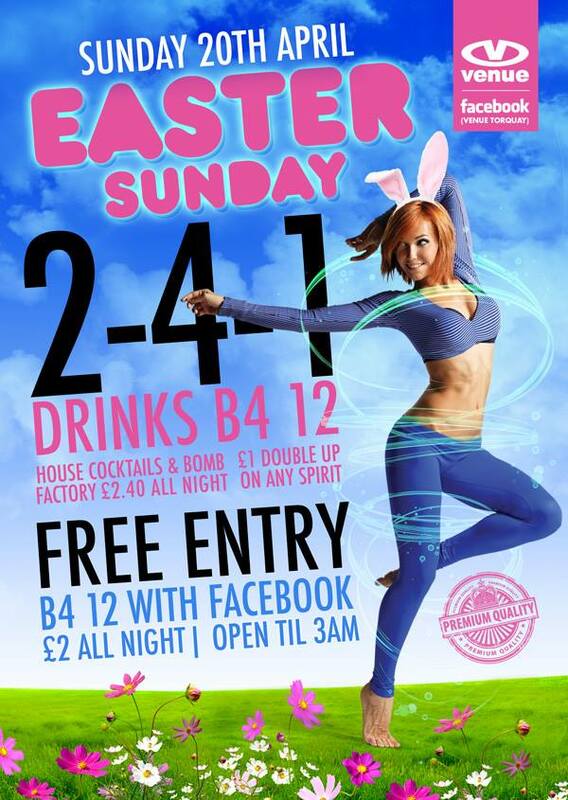 House Cocktails And Bomb Factory £2.40 ALL NIGHT!! 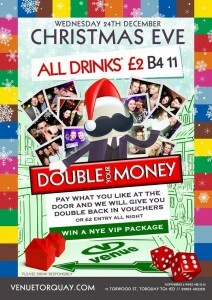 Double Up On All Spirits For Just £1 ALL NIGHT!!! DJ Rix drops the biggest tunes from East Coast to West Coast while we provide the ultimate in American themed beverages! SHOTBYROB Photo Booth and Prop Box! 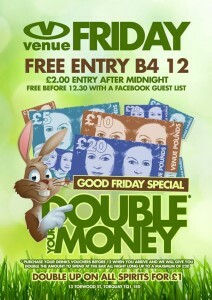 Double Your Money this Good Friday 18 April at The Venue! Purchase Your Drinks vouchers When You Arrive Before 12 And We Will Give You Twice The Amount To Spend At The Bar All Night Long!! Max £20 = £40 per person! 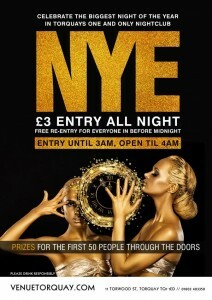 Free Entry Before 12 // Free Before 12.30 With A Guest list!! Double Up On All Spirits For Just £1!! Torbay's first Pop Up Bar launches in the Beach Hut with top funked up house beats from DJ Edgy and Percussion and Live Music from Yerriba! 25+ Flavours of Mojitos and Jagerbombs ALL £3.50 each or Mix and Match 2 for £5!! AWESOME! DJ Brad Clarke goes all out with a massive set featuring RnB/HipHop/Garage and Grime... One for the booty Shakerz! Beer Pong Competitions ALL NIGHT in the Club! SRL Promotions In Association With Jmac Events Are Proud To Present Legendary 90s Boy Band 5IVE Performing Live At The Riviera International Centre, Torquay, This Easter Sunday! Doors open at 19.00 the event starts at 20.00 and will finish at approximately 22.30. Visit the Facebook Event page for more details https://www.facebook.com/events/827841017242240/. or from The Riviera International Centre Box Office 01803 206333. Torbay's first Pop Up Bar celebrates Easter Sunday with the Infamous Wasted Little DJs aka Nick Sharpe and Chris Aston. Expect the unexpected as they take you on a journey through sight, sound and grass skirts! This Hip Hop and Funk Covers 6 Piece band will get you jumping ready for a HUGE night of music! 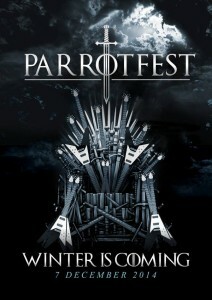 Their set list includes, Cypress Hill, Beyonce, House of Pain, Eminem all with a funked up twist! DJ MARCUS CLARKE leads the Myloclo Bank Holiday Sunday Vibes in the Club with huge beats all night long. Expect dancing all night and giveaways galore with the mental streak that only Myloclo can bring to the party! 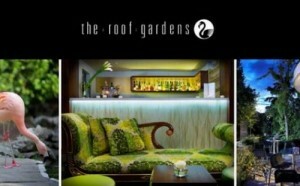 The Roof Gardens, 99 Kensington High Street (London, W8 5SA). Access to the building is via Derry Street which branches off Kensington High Street. The Stonewall Summer Party – supported by Société Générale and Square Peg Media – returns to Sir Richard Branson’s spectacular Kensington Roof Gardens on Friday 13 June. 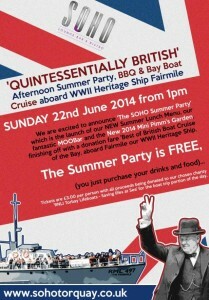 SOHO Bar presents its 'Quintessentially British' Afternoon Summer Party, BBQ & Bay Boat Cruise aboard WWII Heritage Ship Fairmile. Arrive at the very British Mini Pimm's Garden at SOHO, complete with a summer BBQ, where you can wet your whistle with a few jugs of Pimms, indulge in Cream Teas and a cocktail list fit for a Queen (or King)! Departing Torquay, Princess Pier at 6.30pm returning for 8.30pm Keep Calm and Sail aboard Fairmile, our WWII Heritage Ship, for a two hour cruise around the Bay! 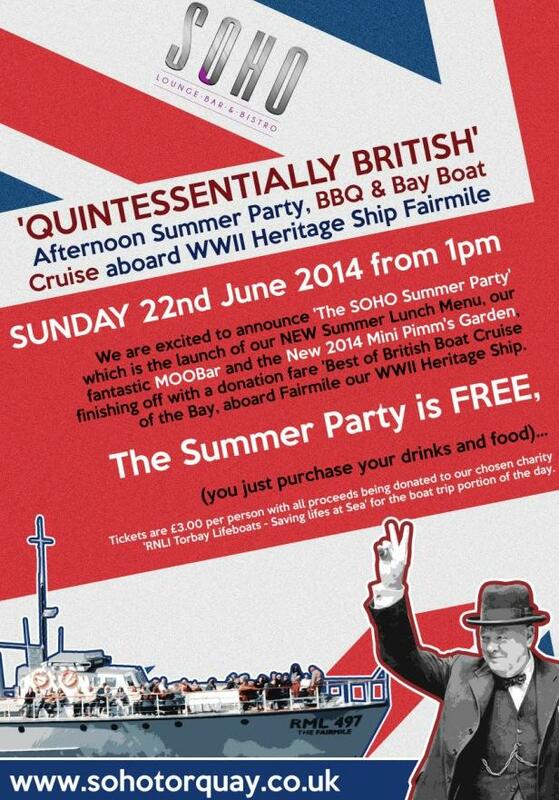 Tickets are £3.00 per person for the Boat Trip element with all proceeds being donated to the RNLI Torbay Lifeboats. Tickets must be bought in advance via the Greenway Ferry website. 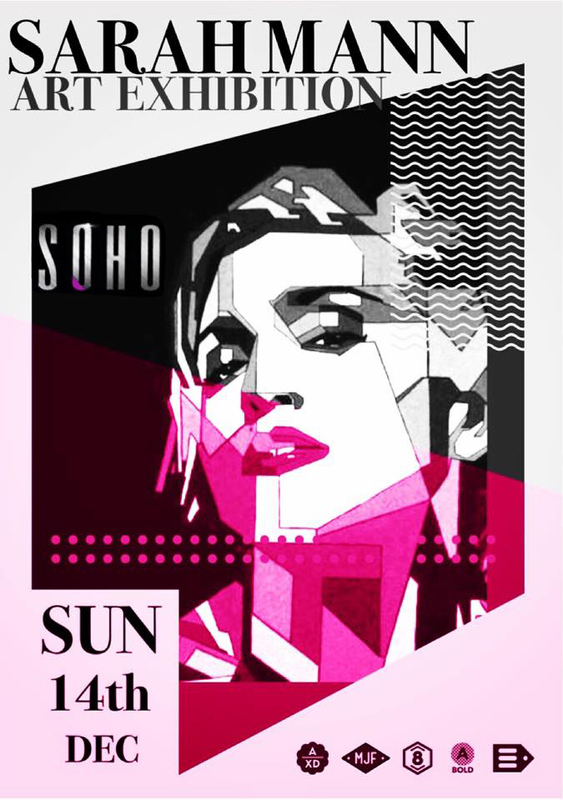 Join us back at SOHO helping to get this very British Party into full swing where the Music and Cocktails will be flowing! The Summer Party is FREE, (you just purchase your drinks and food)... Tickets are £3.00 per person with all proceeds being donated to our chosen charity 'RNLI Torbay Lifeboats - Saving lives at Sea' for the boat trip portion of the day. Tickets for the boat portion must be purchased online at www.greenwayferry.co.uk/2012/soho-quintessentially-british-summer-party so we can control passenger numbers. Join Us This Halloween Friday Night!! 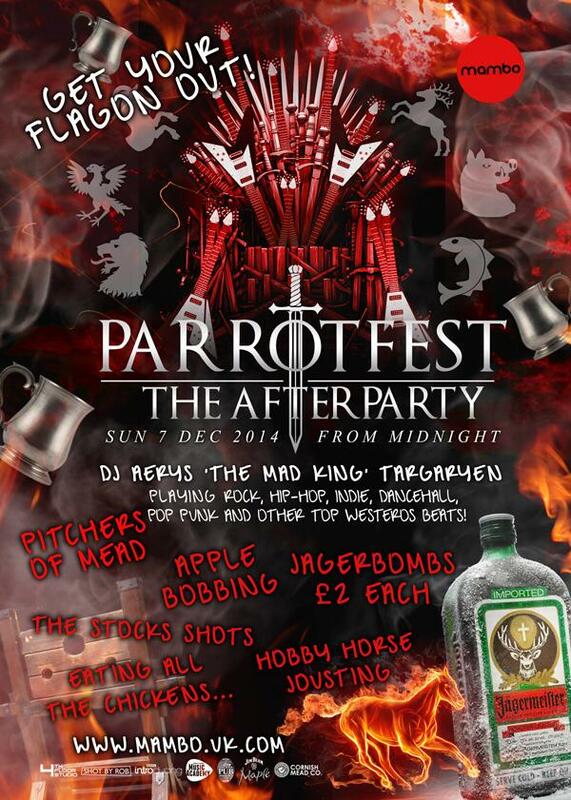 Free Entry Before 12/ £2 After! 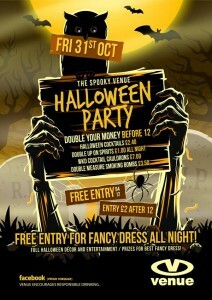 FREE ENTRY ALL NIGHT FOR FANCY DRESS!! DOUBLE YOUR MONEY BEFORE MIDNIGHT!! WKD Cocktail Cauldrons £7 ALL NIGHT!!! 'Double Measure' Smoking Bombs £3.50!! Full Halloween Entertainment and Décor!! This year’s ceremony – which will also celebrate the charity’s 25th anniversary – will be held at the V&A on Thursday 6 November, hosted by legendary comedian Julian Clary. This year’s Award winners will be picked by Lib Dem Peer Baroness Barker, TV star Charlie Condou, playwright Jonathan Harvey, journalist and trans activist Paris Lees and doctor and TV presenter Dr. Ranj Singh. The judges will choose winners in eight categories with thousands of Stonewall supporters picking the winner of the Hero of the Year Award and the Community Group of the Year Award. 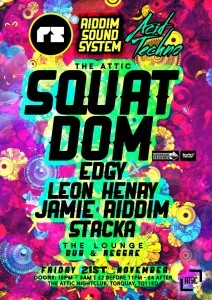 SQUAT DOM - Live Acid Hardware Set! Door Charge £2 B4 11 £4 after. 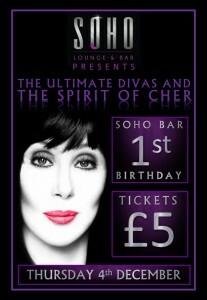 Soho Bar Torquay presents THE SPIRIT OF CHER & THE ULTIMATE DIVAS! To kick-start the SO-CELEBRATION WEEKEND for their 1st Birthday, they've got a double-whammy of TOP UK PERFORMANCES for one night only! 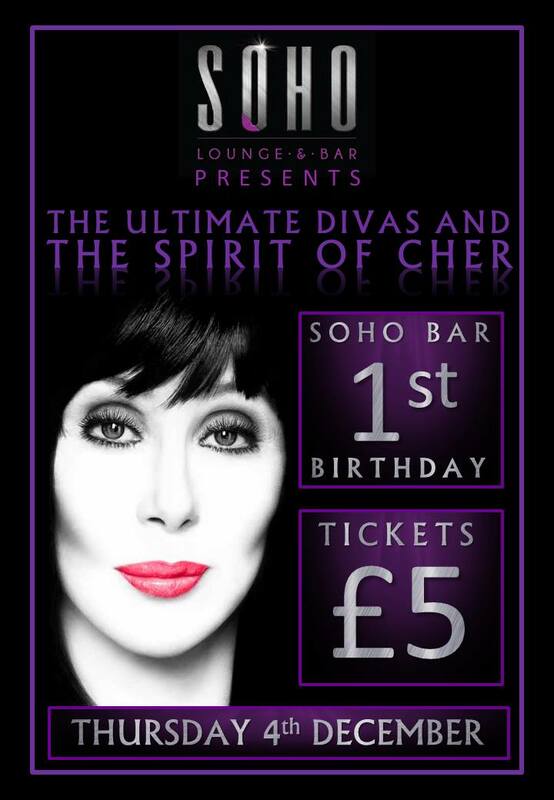 Soho presents DIVA NIGHT on Thursday 4th December - 8pm until late. 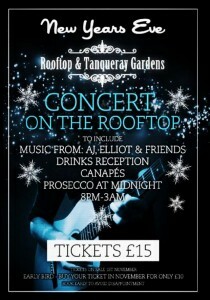 To reserve your tickets please send a private message via their Facebook page or visit the Bar. CAMP AS CHRISTMAS at Soho Bar Torquay. 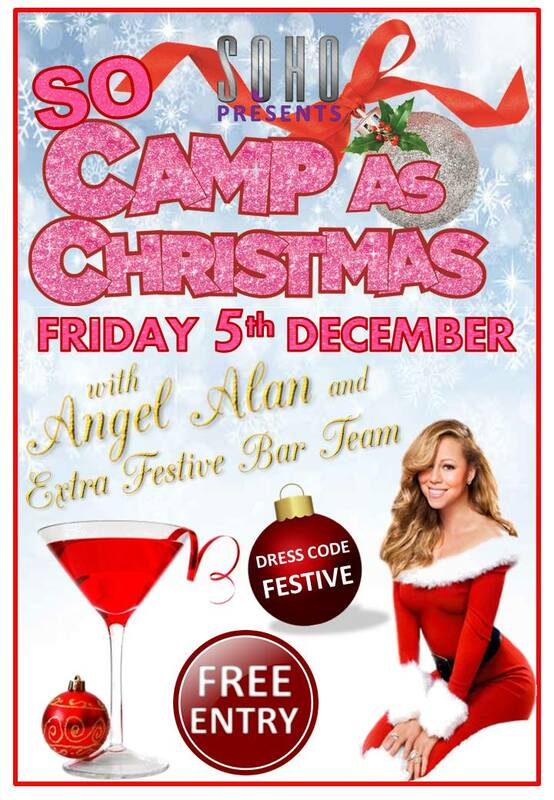 Dig out your Christmas jumper, your tinsel, and your tackiest most festive outfit you can find! 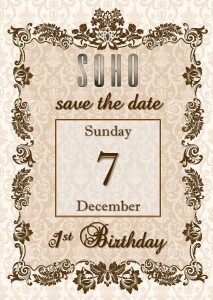 We will be launching the festive season with the cheesiest, campest night ever at Soho! 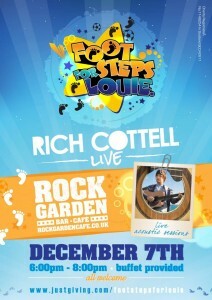 Mariah Carey, Boney M & Cliff Richard will be devastated they are missing out on this! 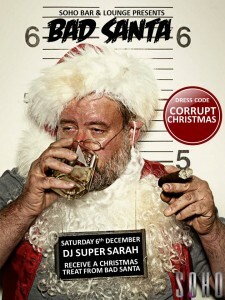 BAD SANTA SATURDAY at Soho Bar Torquay. Think naughty, act mischievous. We have a special visitor for ONE NIGHT ONLY! Bad Santa will be in the building and you will get the chance to sit on "his" knee and receive a Christmas treat! We've obviously been nice all year and not one ounce of naughtiness has crossed our minds. 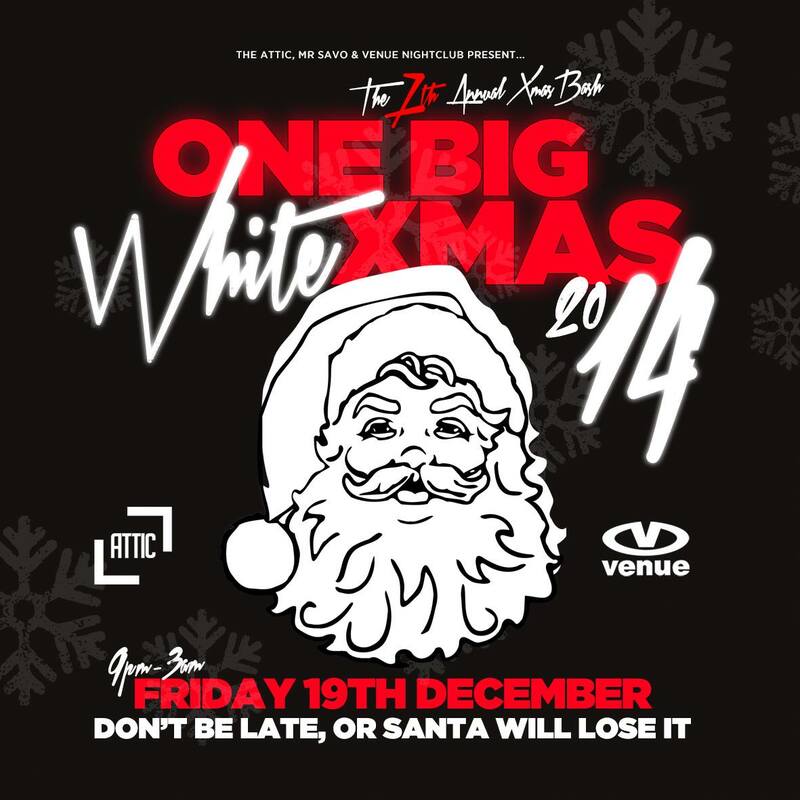 We're looking forward to getting onto Bad Santa's lap and getting a sack full of goodies! 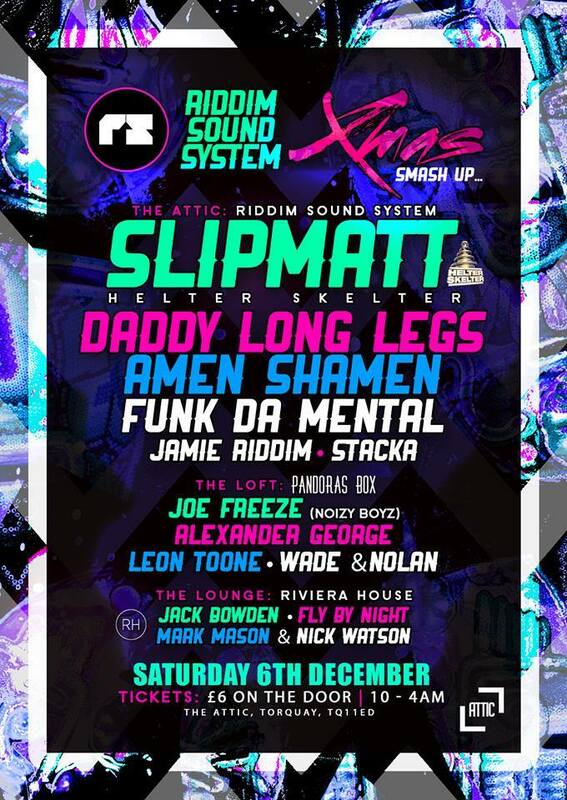 RIDDIM SOUNDS & PANDORAS BOX XMAS PARTY! 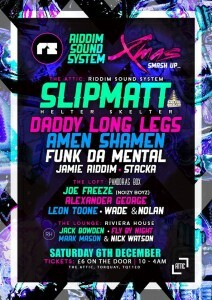 ft SLIPMATT // JOE FREEZE TAYLOR! Pandoras Box & Riddim Sounds Presents..
Pandoras Box & Riddim will be starting the festive season off with a bang!! We thought who better to represent the original flavours, of what our scene is made up of, than DJ SLIPMATT longside the old school legend Joe Freeze Taylor! Joe was rocking Festivals, raves and House parties when most of you were still swimming round in your dads nut sack!! Throw in the local gems and usual crew and we got a party on our hands!! 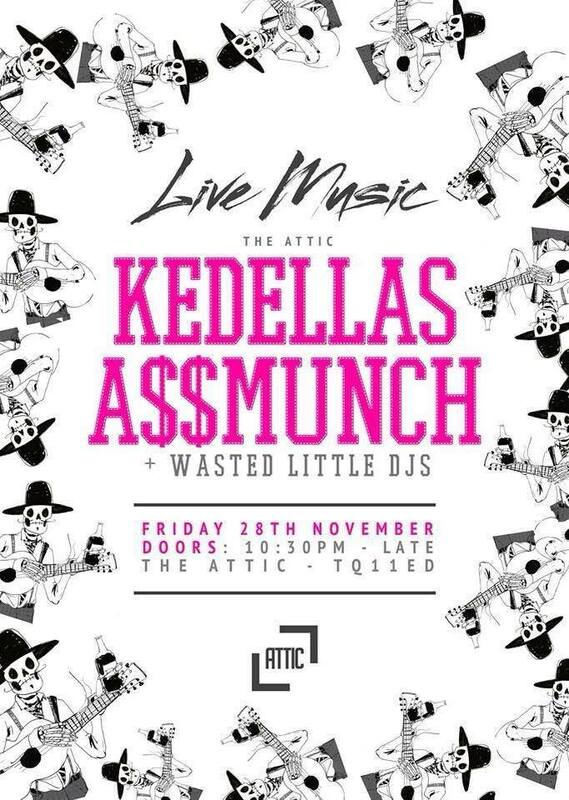 The Attic, Torwood Street, Torquay. Let the good music cometh and the mead be strong. 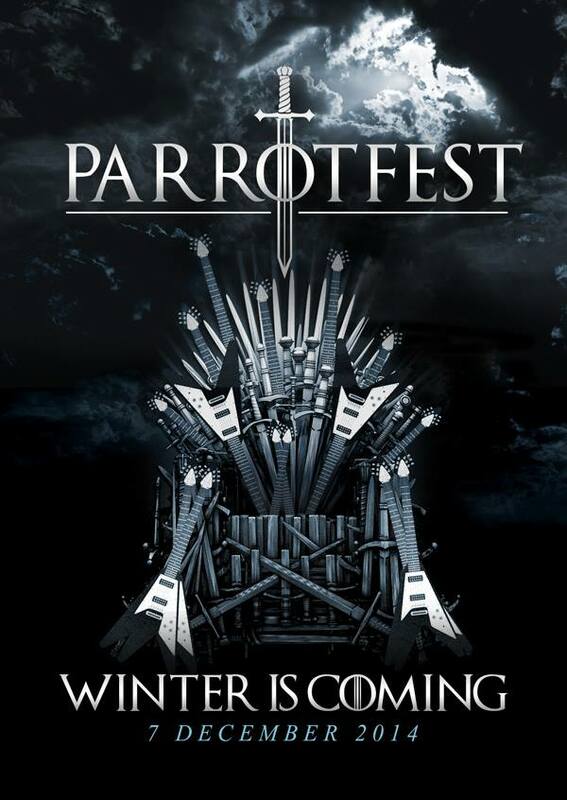 We've got a brutally awesome line up, even more powerful and ear bendingly manipulative than Tywin Lannister himself. Doors are from 11am and as always we areeeeee..
all day & night long. There are plenty of drinks deals throughout the day to keep you replenished for minimal gold. 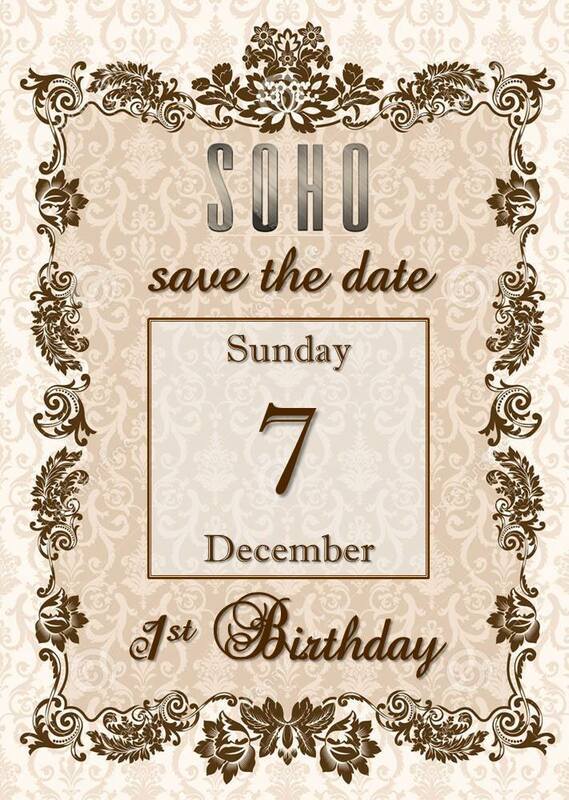 It's SOHO BAR's Birthday Party on Sunday 7 December. Details to be announced. Save the date! Join Rich Cottell on Sunday at Rock Garden Bar Café from 6pm to 8pm raising funds for Footsteps for Louie. Louie needs to raise £80,000 over the next 18 months to help him have an operation to help him walk. The £80,000 will enable Louie's parents to take him to America to undergo surgery called SDR (Selective Dorsal Rhizotomy). This will permanently reduce the stiffness in his legs, enabling him to walk independently. // A proper knees-up... GoT style! 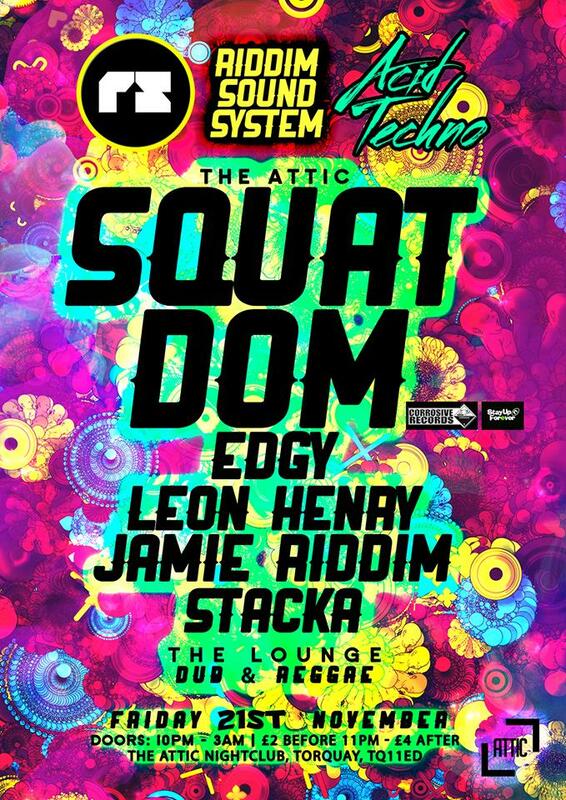 Movementinsound take over the loft @ the attic to host a Sonic Celebration. 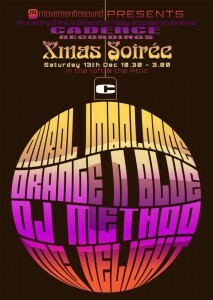 The perfect excuse for a pre crimbo social & a gathering of like minded souls. Sarah Mann, known for her local DJ gigs, will be exhibiting 20 paintings at Soho Bar, Torquay from 2pm on Sunday 14 December. The exhibition will include a number of paintings for sale. 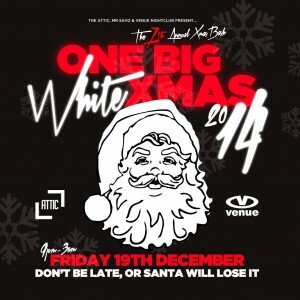 THE BIGGEST CHRISTMAS PARTY IN THE SOUTHWEST!!! Snow Machines and one hell of an atmosphere. 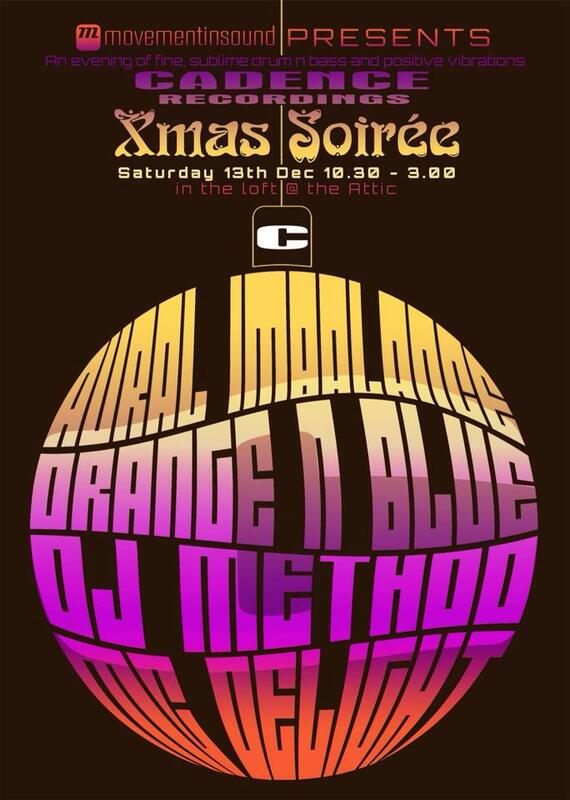 After last year's 1600 people through the doors we're ready to do it all over again, amazing DJs and Bands showing you how a Christmas party should be done. 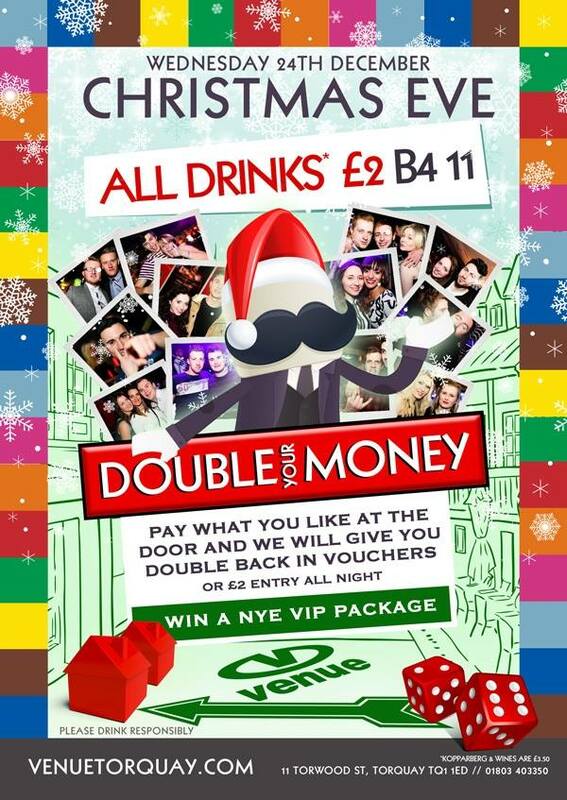 Join Us This Christmas Eve For Double Your Money Special! Why Wait For Santa When Asleep When You Can Party Into The Early Hours? All Drinks Before 11 Are £2. Arrive Before Midnight And We Will Double Whatever Amount You Choose To Pay On The Door In Drinks Vouchers To Spend At The Bar All Night Long! Up To A Maximum Of £20=£40 vouchers Per Person! 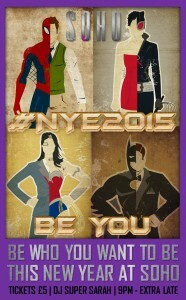 Win A VIP Package For New Years Eve! Get Your Photo Taken By SHOT BY ROB For Your Chance To Win A New Years Eve Package For Free Entry For 6 People, A Bottle Of Absolut Vodka Plus Free Mixers, And A Free Round Of Shots!! 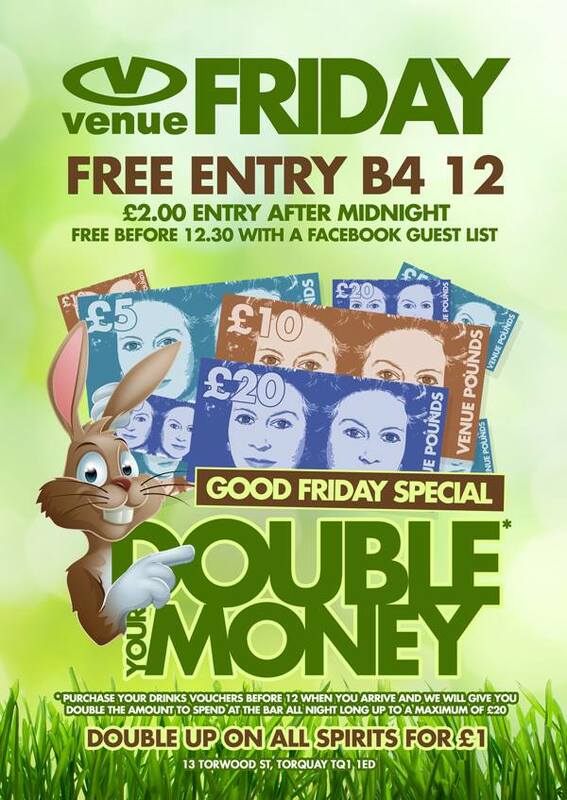 £2 Entry All Night Without! 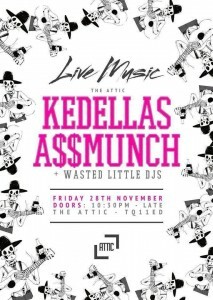 Live Music from 2 bands from 9pm until 1am! Join us at The Rock Garden for Mulled Wine and Hot Apple Cider. Prizes for the best Christmas Jumpers! 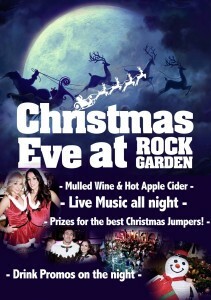 Join Us On Boxing Day For Our Xmas Jumper/Onesie Special!! 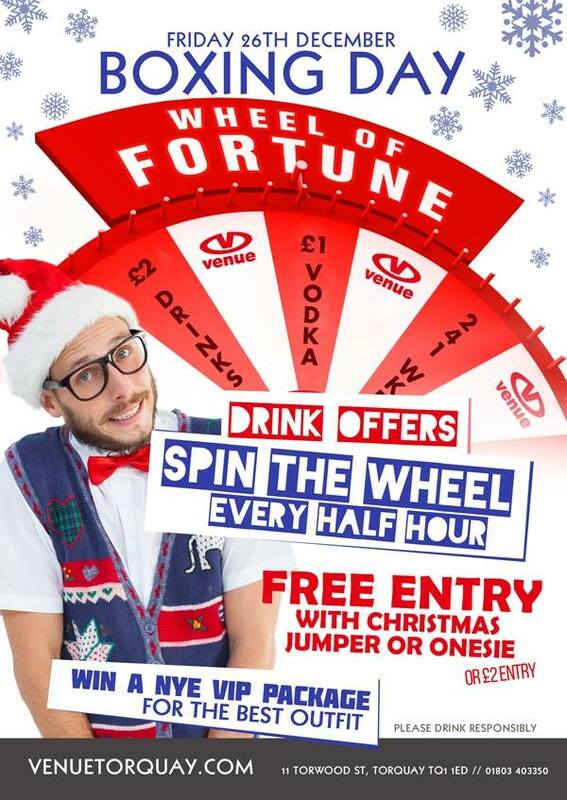 Entry Is Free All Night In A Christmas Jumper/ Onesie!! 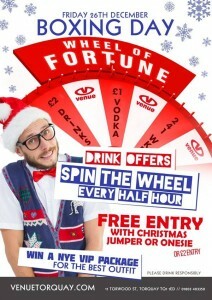 We Will Spin The Drinks Wheel Every Half Hour! Every Half Hour We Will Have A Different Drinks Offer! 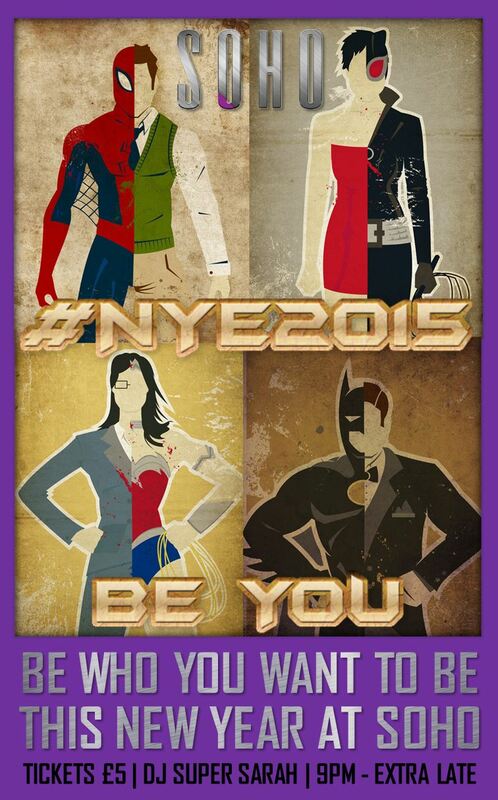 The biggest night of the year returns with our best New Year's Eve Party in years! Full Lineup coming next week....! 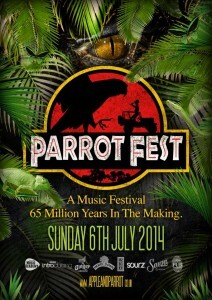 Nearest Train Station Torquay Only 10 minutes walk from venue. 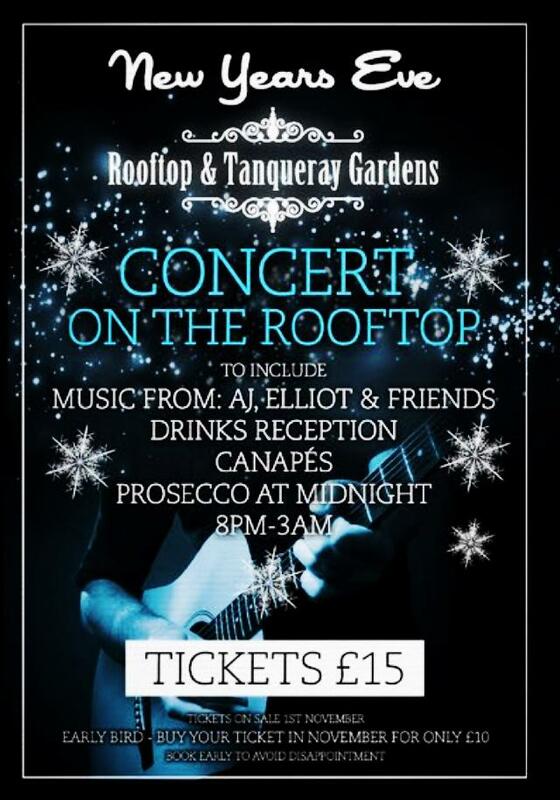 Train services arriving into Torquay until 21.25 New Year`s Eve! 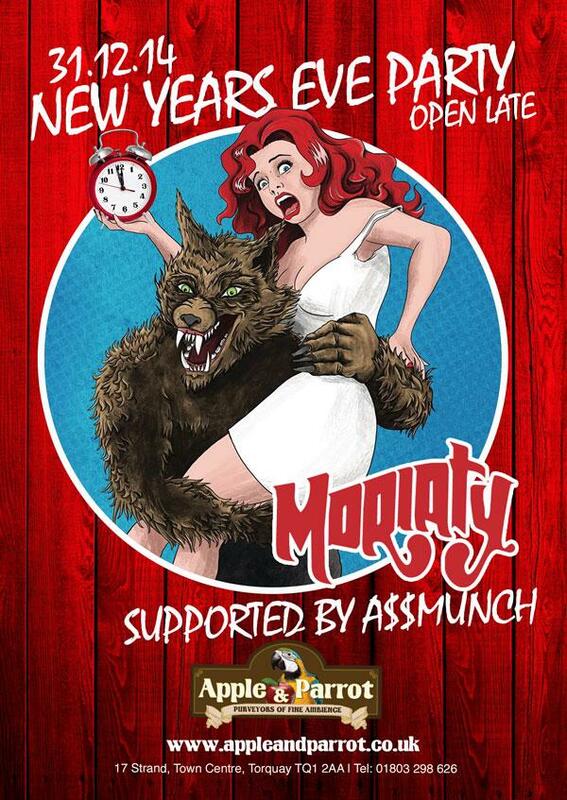 Join Us On New Year's Eve For The Biggest NYE Party In The Bay In Torquay's Only Nightclub! 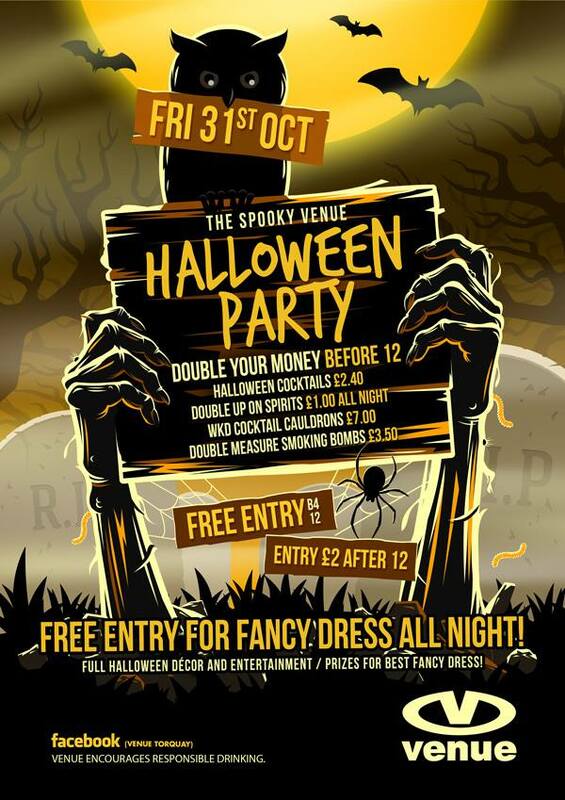 £3 Entry All Night// Free Re-entry Wristbands For Everyone Before Midnight! Two DJs Playing Back To Back All Night! Prizes For The First 50 People Through The Door! 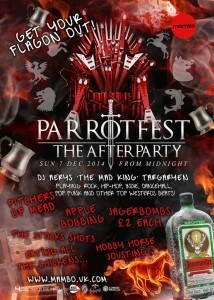 Apple and Parrot's New Year's Eve party! Best way to end 2014 and to enter 2015! VIP PACKAGES ALSO AVAILABLE - EXTREMELY LIMITED!